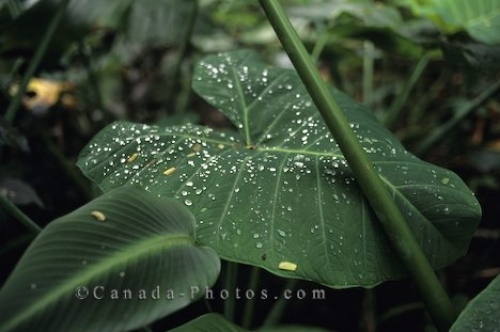 Amongst the greenery in the wilderness of Alaska in the USA small water drops rest upon a large leaf in the morning hours. As you wander through the wilderness of Alaska, USA in the early hours of the day, you can find massive green leaves that are flat and hold onto ice crystals which eventually turn into water drops. As the day progresses, the ice balls on the leaf begin to thaw and small water drops glistening in the light make for an intriguing picture. Picture of water drops on the surface of a leaf amongst the vegetation of Alaska, USA.